GREAT LIVE A BOARD...Anyone looking for a large yacht that needs work...This is the one...Owner started the rebuild and did not finish...I was told that the engines were rebuilt by Atlantic Marine, painted white (approximately 50 hours best guess) and run great...Fore deck (headliner down in salon) was also reinforced with fiberglass...The salon and master state room closet are the only areas that are opened...All of the other state rooms and heads look original. Manufacture's Statement...The Bertram 58 Motor Yacht is over 43 tons of sheer grace and pure power. Imagine a vessel so spacious that ten people can embark on an extended voyage without feeling crowded or confined. Even the flybridge can accommodate eight comfortably, as the soft ride of the Bertram deep-V hull glides over jagged waters at 26 miles an hour in conditions that other yachts would find a hardship. And yet, for all her grandeur, this 58-foot masterpiece performs with amazing economy. A fore deck with a built-in lounge is large enough to serve as a private terrace, while the cabin top can serve as the perfect sundeck. The aft deck is a patio for cocktail parties, champagne breakfasts, or just plain lounging and relaxing. The stereo systems, air conditioning, wet bars, ice makers and remote-control televisions are all standard equipment. The salon is an arena of luxury, equipped as it is with an electronic entertainment center, a dining table and a unique salon - galley divider. The galley is elegant and complete. The forward stateroom features upper and lower berths with ample closet and drawer space. Also included is a built-in ladder and shelf for quiet, unnoticed arrival and departure. The amidships guest stateroom is equally as private. This room adjoins a full-size head with a shower and comprises twin beds with plenty of locker and drawer storage. The master stateroom has a full side-to-side closet, hideaway vanity, remote-control TV, desk, and a king-size bed with bilge alarms and light controls conveniently built into the headboard. A shower and bathtub round out a full-size head adjoining this stateroom. 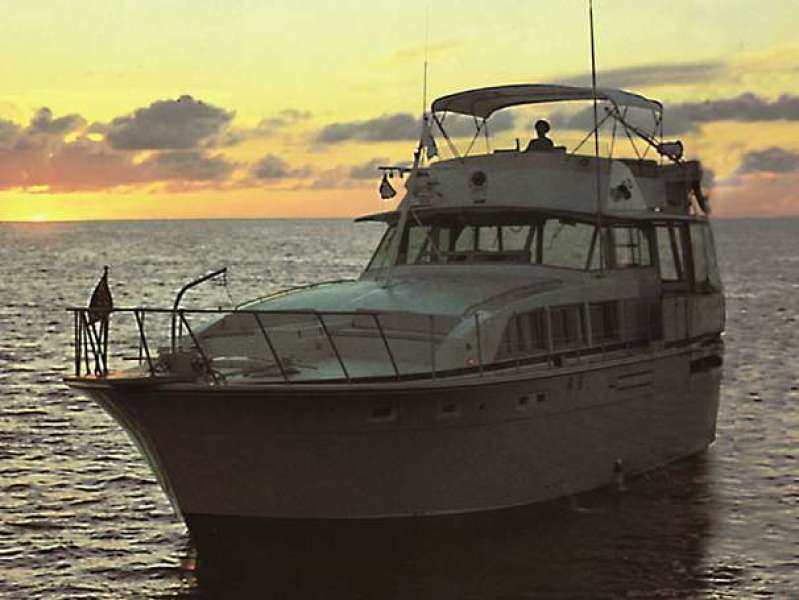 United Yacht Sales New Jersey would love to guide you through a personal showing of this 58' Bertram 58 Flybridge Motor Yacht 1981. 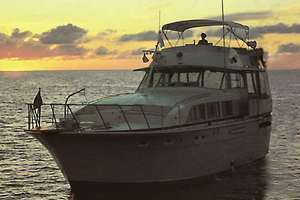 This yacht for sale is located in N Miami, Florida and priced at $65,000. For a showing please contact us by filling out the form on this page and we will get back to you shortly!